*Thank you for everyone who applied for tester positions yesterday, the positions have all been filled, however could ‘Unknown’ who is also a No-Reply Blogger let me know who they are please?! 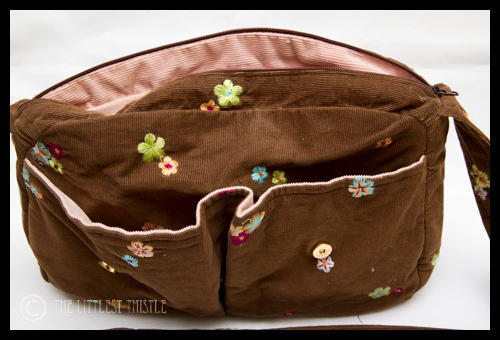 I bought the pattern and the fabric for this bag around about the time I graduated from uni in 2002. As I recall, the pattern was one of the big name ones, you know the kind, tissue paper pattern, instructions leaving a lot to be desired? I suspect it was Butterick or Simplicity, but I can’t find it either in person or online. That’s probably a good thing, as you can’t see what it was *meant* to look like ;o) Anyway, I didn’t touch another bag pattern after this one and one other for about, oooh, 9 years! 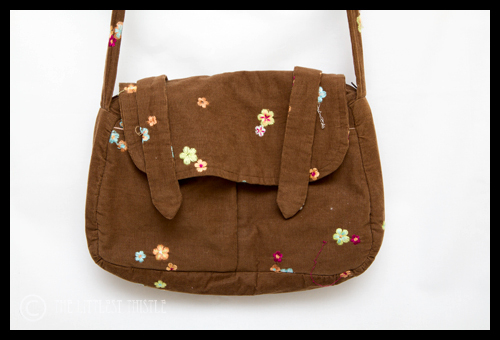 This fabric – I loved this pincord, but those flowers were unravelling a little even when I bought it, and I had no idea how to fix it when it unravelled on the bag. Also it was definitely not on the recommended fabric list. Those straps should have been stitched onto the flap, but I just couldn’t work out the instructions, and by that point, it had taken me so long to get that far that I couldn’t be bothered, I was losing the will to live! Oooh, and what’s this? Oh yes, the basting stitches holding the zip in place. I was too scared to remove them. I still am. How did I do joining the gusset to the front/back? Wrinkly apparently. How does it stand up? Badly! And see how it’s kind of sitting funny? That’s because I used heavy duty dressmaking type interfacing, the kind that’s like thick paper. It is not kind to bags! 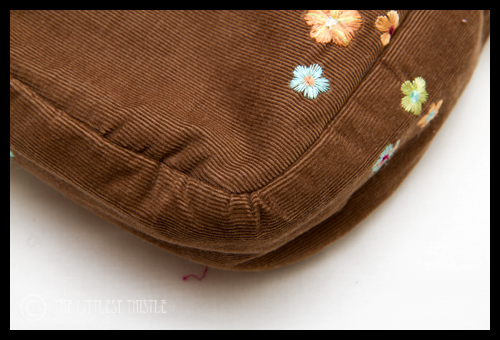 You can also see the funny wrinkly texture where pincord and heavy interfacing are not meeting harmoniously. So what have we learned from this horror story children? Don’t buy patterns for accessories from the big name pattern companies, their instructions are terrible! Indie designers generally put a lot more time and effort into their patterns, mainly because they’re not as concerned about trying to cram instructions on as few pages as possible for multiple designs. Don’t ignore instructions, or you will find your seemingly practical bag rather challenging to get into. 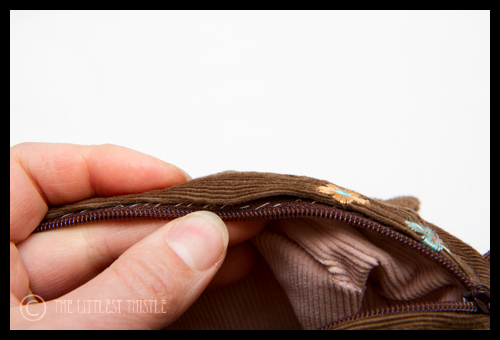 Magnetic snaps need more reinforcement than a layer of fabric can provide, unless you want to pull the whole thing through the fabric. If you’ve had to baste something, remove the stitches once you’ve done the main seam, don’t leave it til later or they will be a bugger to remove. Or you may fear that it’s actually holding something vital in place. 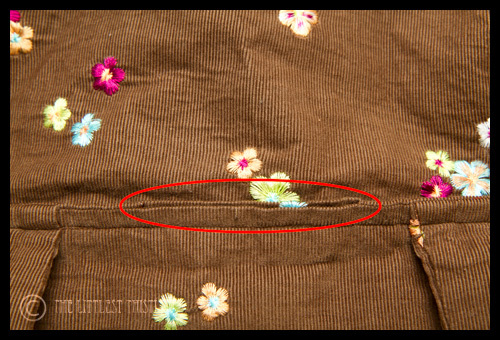 Note that basting stitches should always fall inside the stitching line! I LOVE looking back at my early stuff and seeing how far I've come. I have my very first quilting attempt that is the saddest thing ever that I'll have to share. It's much worse than anything you have up there. Ha ha! 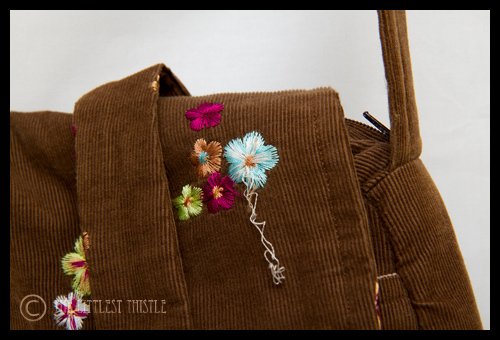 I actually really like that bag – I can see why you went for the embroidered cord! very nice. Great advice especially re. the wrinkly bottom. We all have to start somewhere, good for you showing it. Awesome post 🙂 If I ever made anything crappy I'd never know, I gave it all to friends and family!!! I have taken particular note of point 7because the prospect of a wrinkly bottom looms closer every day. The overall appearance of the bag was and still is very nice. I'll take note of point 7! I thought your bag looked great, but your tour was very enlightening… I'm laughing at Sarahs comment! It is always good to keep our 1st's. We can see how far we have come. It applies to bears as well. Great to see how far we travel on this sewing trip, huh? I lioke your point about indie designers, too… 😉 Some of us spend a little bit too much time making sure people will get the results they want. Good to know it's appreciated. If only clipping curves would fix mine! Maybe a litre of botox would do the trick. It's good to see how far you have progressed on your bag journey. I'll take note of never trying McCalls, Butterick etc bag patterns. I'm not great at following instructions, so tend to stay away from big name patterns! But occasionally students want to work from a pattern – and my heart sinks, well done for making what looked like a great bag, until all it's faults were pointed out!!! I love the cord!! And for a first attempt I think it was brilliant! I wonder if my mum still has my GCSE textiles bag!! Now that was a horror. And thank you for helping me learn through your bag making mistakes!! excellent advice, especially the part about the wrinkly bottom. My bag making issues are that the handles end up coming detached! Not good and not really brilliantly fixable once they start to come undone. We all have to learn by doing and it looks like you've learned a lot about what not to do. The bag looked pretty darn good until you started pointing out it's flaws. So, you clip a wrinked bottom??? 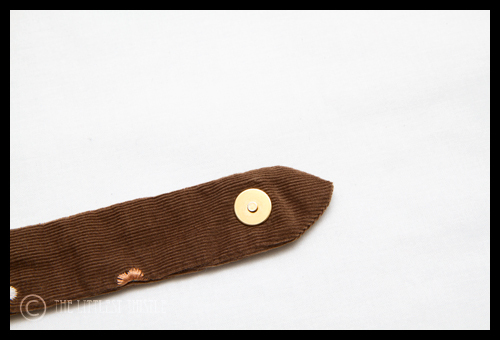 Brown corduroy you say? Surely a little surprise prezzie for Miss. Hadley no? Thank you so much for keeping it for 9 years to use later as a cautionary tale though.I must confess to being scared sh**less of making bags for every single reason you listed here ! Oh girl, tell me! I bought a McCalls pattern for a bag! I give it 1 star! It was the most terrible pattern! It had missing instructions! If I didn't have a few bags under my belt, I don't think it would have gotten finished. Plus, I HATED the tissue paper;) The patterns I have bought from blogs (e-patterns) are much better. Emmaline Bags has some great ones. Plus, if you get stumped, you can email her! I should have mentioned Sew Sweetness too. She has a whole new array of bag patterns!